I’ve been on this journey to healing my gut for … oh… about 4 years or so. The first 3 were mostly struggling with natural and chemical “regulators”… if you know what I mean! I was tested for Celiac’s Disease, and that came back negative… so I didn’t think that Gluten was my issue. I’m constipated like crazy, so I didn’t think Lactose was my problem. But I was going nuts trying to figure out just what WAS my problem?! Then a few months ago I stumbled upon this YouTube interview (audio only) with Dr. Mercola and Dr. Natasha Campbell-McBride. Seriously… it’s a life-changer! I spent the entire interview having ah-ha moments and taking notes furiously. In a nutshell, she wrote a book called Gut and Psychology Syndrome that will blow your mind. Pair that book with another AMAZING book called The Mood Cure, by Julia Ross, and you will absolutely – without a doubt – change the way you think about food, how your body processes it and how it affects our minds, moods, and daily lives. Basically, we are royally screwing ourselves out of optimal health and well-being with our instant-gratification, easy-peasy, convenience-first lifestyle. Plus all the things we think are helping us, are really just wrecking our gut flora…Birth control Pills, anti-inflammatories, anti-depressants, all of them kill off good bacteria, and now our bellies being overrun with bad bacteria and yeast. I won’t go into the details, but let’s just say that I have had a HUGE wake-up call and am now trying to revamp my eating habits in order to get my gut flora back in check. Fermented foods. Sounds crazy, right? However, it’s the way Grandma and Great Grandma did things out of necessity and tradition. And then… as the years went by… life got easier and more convenient and BIGGER… and so did our food. The old ways of doing things are not being passed down and we are totally forgetting that they even WERE the way to do things. But I have been fortunate enough to stumble upon these things over the past year, and I’m trying to incorporate these old school gems into my daily diet as much as possible. Which brings me to today’s post! I’ve tested the fermentation waters with sauerkraut, pickles, and green beans… and now I’m going to tackle some other veggies. I adore Giardiniera Mix, so that is a great place to start! I found some locally grown cauliflower, and I had just bought some celery and carrots… so I was ready to get going! I could’ve added some peppers, onions and garlic… but I didn’t want to go back to the store… so my mix is a less complex mix, but you could totally add in there whatever veggies you want! Here are the video tutorials! This is my first video… so… we’re still getting the hang of it. Hopefully I gave you all the details you needed! Remove veggies and mix them up in a bowl. 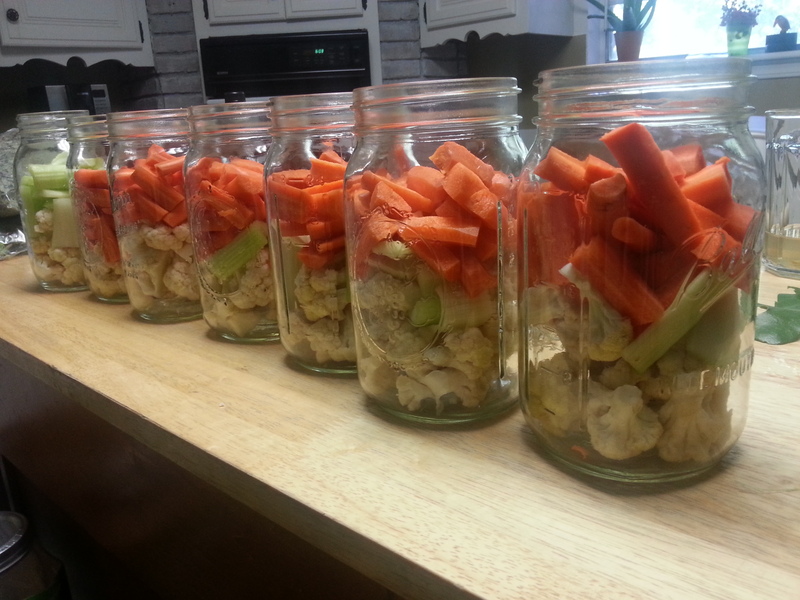 Put your veggies back into the jar and really pack them down tight! Dissolve 1 1/2T Sea Salt into 2 c filtered/purified water (or tap water that has been left out for 24 hours do let the chlorine evaporate) and pour over the veggies. Weigh veggies down with either a fermenting weight or a baggie filled with brine solution, and then cap with an airlock lid, a 2-part canning lid with the disk turned upside-down, or just a towel secured with a rubber band. Put in a dark cool place for 2 weeks… then ENJOY! note: fermenting times vary depending on the temperature and your taste… start tasting your veggies as soon as 4 days on up to a month to see what you prefer.